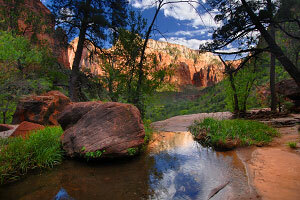 Emerald Pools is a Zion classic: an oasis in the middle of the desert. The hike is a collection of short trails that meander past a small, lushly-vegetated stream that rolls down from the cliffs and forms several interesting "pools." If you have only two hours to spend on a leisurely non-strenuous hike with the entire family, I would probably pick this one. As this hike is not very difficult and it is located just across from the Zion Lodge, this trail gets crowded in the summer months, so be prepared to share the views with many other people. The trail is family-friendly, but keep a close eye on your children; do not let them play or run by the cliff ledges. SPRING 2019 NOTICE: Due to trail damage from a big storm in July 2018, several sections of the Emerald Pools Trail including Upper Emerald Pools, Lower Emerald Pools behind the waterfalls, and the Kayenta Trail (the connector trail from the Grotto Trailhead to Middle Emerald Pools) are CLOSED. Please check with park rangers for updated conditions. Access: The Zion Lodge (the 5th stop for the Zion Canyon Shuttle in Zion's main canyon) or the Grotto (the 6th stop) via the slightly longer "Kayenta Trail." Length: Roughly 2 miles, depending on which loops you hike. Elevation Change: 200-ft elevation gain to get to Middle Emerald Pools and another 200-ft gain to Upper Emerald Pools. Seasons: Year-round. Spring and fall are most pleasant; summer can be very hot with the falls down to a trickle. 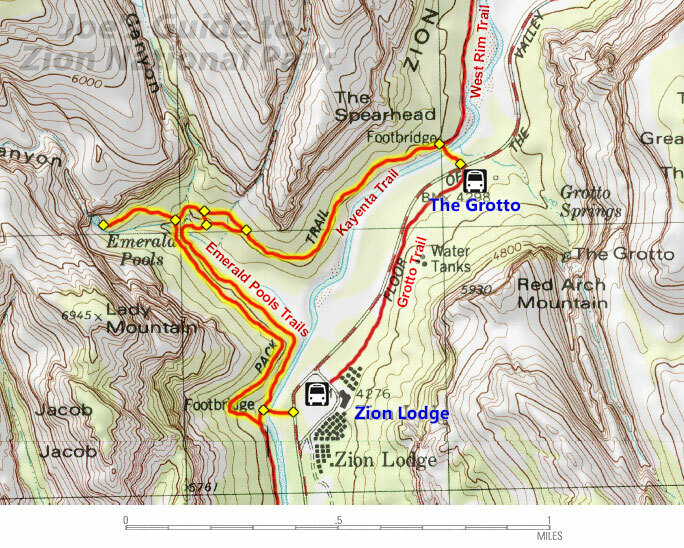 The most likely starting point for this hike is at the Zion Lodge. Cross the footbridge and follow the trail that goes north along the Virgin River. (You can also get to Emerald Pools from the Grotto bus stop, hiking southeast on a little connector trail, recently named the "Kayenta Trail.") Total time for this hike: 2-4 hours (depending on how leisurely your stroll). 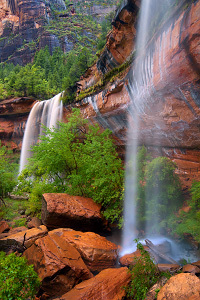 LOWER EMERALD POOLS: In less than half a mile, the vegetation becomes more lush and the trail makes its way along a tall alcove under two tall waterfalls and the pools below. Getting to this point is quite easy even for the elderly and baby-strollers. MIDDLE EMERALD POOLS: Beyond the alcove, the trail gets more difficult and steps up and around to bring you on top of the cliff that you just walked under. The middle "pools" are the streams that form the waterfalls. This section is quite beautiful. UPPER EMERALD POOL: The final stretch is a hot and sandy quarter mile, but it is well worth the effort to get to the final pool at the base of the 300-foot cliffs above. The upper pool area is a great area to find a shaded boulder to relax and have lunch. Most of the time, you can see a faint waterfall coming from the mouth of Heaps Canyon far above. For the return trip, you can either retrace your path or take the optional loop back to the Lodge. While you could play in the water and explore around the pools in decades past, the trail now has many fences, guardrails, cliff warning signs, and "keep out of the water" restrictions: necessary evils to protect the beauty from the overwhelming amount of human traffic that its popularity has generated. Since this is one of the park's most popular trails in Zion's "frontcountry," many people with little experience in the outdoors will be hiking here. Since the massive rainstorms and floods of December 2010, the southwestern spur trail to Middle Emerald Pools has been damaged and closed indefinitely. Please obey all trail closure signs. For a longer hike, you can include the Kayenta Trail and the Grotto Trail to make a loop that starts and ends at the Zion Lodge. This hike is a perfect short and easy hike for tourists and first-timers to Zion, but be prepared for potential crowds. Also keep in mind that waterflow in Emerald Pools is usually quite light, so if you are expecting Yosemite-volume waterfalls, you will be disappointed unless you are visiting during the spring runoff or during a rainstorm.